As we approach the season of Advent, a season of preparing for His arrival, we know that you like to prepare your calendars as well. 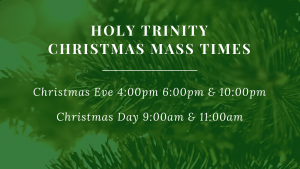 Below is the times we will be celebrating Mass at Holy Trinity on Christmas Eve and Christmas Day. We hope you will join us! In the meantime, please check out all that we have going on during Advent by clicking here.